Exploring British Design is a proof of concept, cross-sector web portal that conjoins data, expertise and audiences. It connects and amplifies information about Britain’s rich design history held in numerous museums and archives. 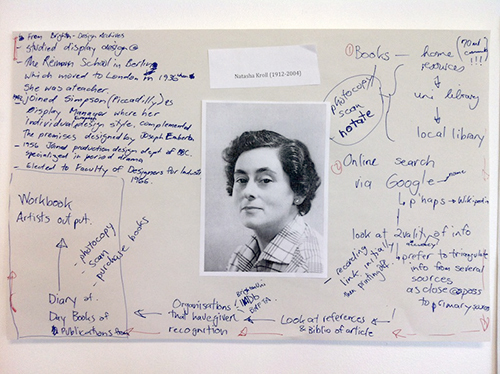 Through the building of detailed biographical authority records as entry points, linked together by the relationships between people, organisations and events, the project, funded as part of the AHRC’s Digital Transformation Scheme, enables researchers to see the possibilities of self-directed exploration and to build narratives of numerous kinds across collections and across institutions. A co-designed collaboration between a university, a data service and a museum, challenging conventions in the presentation of design historical sources was a core aim. By linking archival content through biographical authority files that provide rich context through both relationships and chronologies, the project created entirely new routes by which to discover design archives. It revealed the dispersed, nationwide footprint of Britain’s design history, and how information about a particular designer, or manufacturer, or event, might rest in a wide variety of archives. Moreover, the imperative of this project, to show connection and to loosen institutional boundaries established a challenge to the conventional ‘top down’ presentation strategies of museums and archive online systems. Researchers: Principal Investigator, Professor Catherine Moriarty, University of Brighton; Co-Investigator, Jane Stevenson, Jisc; Data Developer, Pete Johnson, Jisc; Data Editor, Anna Kisby, University of Brighton; Web designer, Tom Hart, Jisc. Expert group: Susan Bennett, Chair of the William Shipley Group for RSA History; Sue Breakell, Archivist and Senior Research Fellow, University of Brighton; Dr Elizabeth Darling, Oxford Brookes University; Professor Harriet Edquist, RMIT, Melbourne; Jochen Eisenbrand, Vitra Design Museum, Switzerland; Karin van der heiden, Director of parkc, Netherlands; Catherine Ince, Barbican Gallery, London; Christopher Marsden, V&A; Dr Lesley Whitworth, University of Brighton; Professor Jonathan Woodham, University of Brighton. Jane Stevenson wrote a series of observations about the project as it unfolded on the Archives Hub blog. Anna Kisby wrote an article for the archive and records community, ‘Creating Exploring British Design: a prototype website exploring linked data, an entity-based approach and collection enhancement’ ARC Magazine May 2016, 7-9. 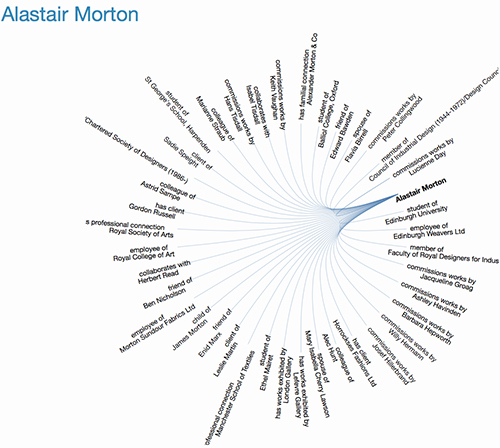 Catherine Moriarty wrote an article for designers and design historians, ‘Monographs, Archives, and Networks: Representing Designer Relationships’ Design Issues 2016 32:4, 52-63. Presentations were made at the following academic conferences: C. Moriarty and H. Edquist (RMIT) ‘Curating Design Archives data for research collaboration’ at Digital Resources in the Humanities, (Perth, Australia 2014) and at Design Resources: Now and Future, National Museum of Modern Art, Tokyo by invitation of the Graduate School of Cultural Science, Saitama University, funded by the JSPS (Grants-in-aid for Scientific Research), November 2014. In January 2017 Catherine Moriarty spoke about the project at ‘Graphic Design Archives: Today and Looking Forward’, National Museum of Modern Art, Tokyo, by invitation of Kyoto Institute of Technology as part of the Japanese Agency for Cultural affairs ‘Model Project for the Development of Design Archives Graphic Design Field’. Presentations were made at the following conferences with professional audiences: C. Moriarty at the conference of the International Confederation of Architecture Museums, (New York, September 2014); J. Stevenson at the conference of the European Libraries Automation Group, (Stockholm, 2015). A poster was included in the 2015 International Design Congress, 17-23 October, Gwangju, South Korea. The project has been showcased at other AHRC events: C. Moriarty was invited to speak at End of the Material Archive, Senate House (April 2015), and at the NeDiMAH final event, Beyond Digital Humanities, School of Advanced Study, May 2015.